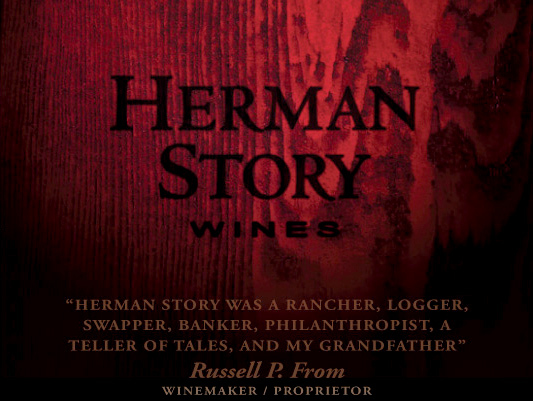 WineWalkabout: Herman Story Paso Robles. One beautiful sunny Californian winter day, Koala drops his car off at the mechanic for a service, and decides to walk around Paso Robles just because. Because why you ask, well, because it was such a lovely day to wander for an hour and just enjoy and breathe. As chance would have it about a hundred yards (90meters) down the road Koala nearly walked into a sandwich board sign that said “open wine tasting”. Well what were the options? Only one that Koala could think of, go in for a taste. He did not want to let anyone down. 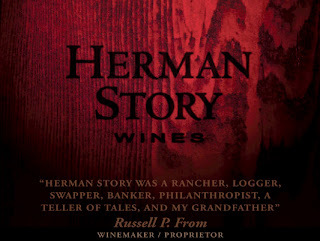 The surprise find was Herman Story Wines. It is a cute little tasting room a few blocks off the beaten track at 1227 Paso Robles Street. Warmly welcomed into the tasting room by the young lady and gentleman behind the counter, one felt immediately at home. Next up was the welcome from the resident dog, a German Short Haired Pointer who will love anyone who will play ball. Did Koala mention the dog came over the counter to greet you personally? Wish we could remember his name. This is a small production winery that takes a no nonsense, non poncey attitude to the wine making and tasting process. Some may say, even a little wacky and off center, which is probably taken as a complement and should be. This attitude is carried through to their labels and tasting notes and everything in between. The wine however is not to be taken lightly. These are some serious wines. No really! There were four wines on offer for tasting, a white, and three reds. All, were a good drink! Rather than go thru each offering, Koala is just going to tell you about his choice, and more later, when Kiwi can also share. This way maybe we can talk with the wine maker and get you some inside scoop! In the meantime here is some info from the website. We normally would not do this but the unique way this is written begs for sharing. Make no mistake this is a bold, full bodied, dark berry, spicy wine with a nice minerality and a strong yet elegant finish. Koala thinks that a couple years in the bottle and this may be a “go to” for “rack o lamb” night! A 7+ and ** now and, maybe an 8 with a little time. I know what you’re thinking; “what happened to the Larner Syrah and Larner Grenache? What’s up with this blend of the two?” Well, here’s the thing; I had every intention of making both wines, I really did, but as I was tinkering in the cellar I noticed that the blend was just better than either of the two wines alone. I’m not much of a stickler for rules, I’m just out to make the most exciting wines possible, so at the expense of doing a 10 year vertical tasting of Larner Syrah, I decided to go for what felt right. Think of it as cake and ice cream, both are pretty awesome, but put them together and, bam! you get a la mode. This is the best Sunday drive ever. It starts at home with smells of cranberry granola, ripe raspberry, coco dust, and cherry 7up, and moves into the country with scents of fresh lumber and cut hay, sassafras, orange blossom, bark and potting soil. The palate brings the drive back to the kitchen with flavors of chicory coffee, black pepper, rhubarb pie and hibiscus tea. Truly a journey worthy of a day. This sounds like a description that we would write. Okay, maybe not as sarcastic as we would write, but good just the same. Koala 'recommends' you “go check Herman Story out”. It’s worth it! Tell’em Koala sent you! Open Thursday – Sunday from 11AM – 4PM and they would love to see your shining face there.